Several years ago the youth ministry I lead and serve underwent a significant paradigm shift in regards to short-term mission trips. I had become, along with many of my youth and leaders, disenfranchised by the conventional models of week-long service blitzes. A service blitz is where a group of people, e.g. Christian youth, participate in swift and vigorous altruistic barrages that, when gazed upon at a distance, i.e. by family and friends back home, they appear beautiful, brilliant, and powerful. However, when one zooms in to the actual site of these service blitzes it becomes evident that the activity may have been more destructive than glamorous and more divisive than luminous. In other words, much like lightning  that is appreciated from afar but not so much when it strikes a golfer on the 18th green, service blitzes may at first glance have the appearance of faithful mission yet elicit a different reaction by the communities whom experience such short and quick bursts of altruistic electricity. Instead of naively blitzing communities with the assumption that we were going to serve and save, our youth ministry now embarks on pilgrimages. We adventure into diverse contexts , domestically and internationally,  and travel alongside local pilgrims as they open our eyes and ears to the thin and dark places of their communities. While we may serve and work alongside these pilgrims on a variety of projects, mostly we enter into faithful dialogue and lean forward as we hear stories about the local incarnations of God’s kingdom. No matter how short the distances and familiar the route you travel on a given day, you can do it as a pilgrim- and no matter how long the journey or how sacred its destination, it is possible to be nothing more than a tourist. Whether the journey is within your own backyard or takes you to the other side of the world, the potential is there for the greatest of adventures: a journey not only toward Christ but with him (xvii). This is the posture that I have found to be most beneficial in regards to youth ministry and ecclesial partnerships. Instead of looking for opportunities to busy ourselves with labor and projects that we deem appropriate as privileged suburban Americans, the Imago Dei Youth Ministry has chosen to look for opportunities to travel, near and far, as pilgrims. Again, sometimes these adventures incorporate a wide variety of service opportunities; other times we venture as listeners, learners, and observers who take in the stories of those we encounter in whatever context we have landed. And this pilgrim posture has aided our students in their day-to-day travels, not only those that occur every summer. 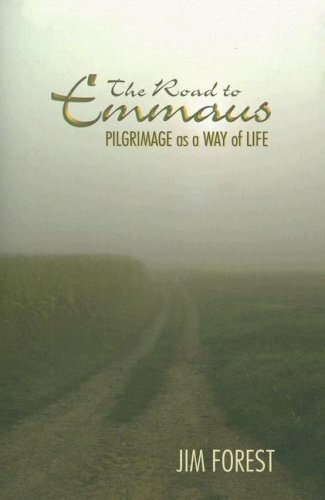 "If thin places are focal points of pilgrimage where ordinary matter seems to shine with God’s presence, perhaps we can describe those places of that seem forever shadowed with the power of destruction as dark places- battlefields, places of torture or mass execution, areas associated with genocide, slave markets, and concentration camps- all those places that seem at first to proclaim the absence of God" (85). “Roads have a sacramental aspect: a road is a visible sign of a hidden unity. Roads are a map of human connectedness” (3). "Meanwhile, nothing we do is meant to be 'mereley physical or 'purely' spiritual. every act has the potential of uniting the physical and the spiritual- not only receiving communion or making the sign of the cross or kissing an icon, but also shopping, house cleaning, playing a game, washing the dishes, or making love. Even our most tangible thoughts and daydreams occur mysteriously in our tangible flesh" (7). "Part of the work of a pilgrim is to be surprised...To pay attention to passing faces is a school of meditation and prayer" (11). "The circular, cross-containing maze [i.e. labyrinth] is a simple map of the path to sanctity, a wordless image of the New Testament. Its message: Follow the path of the gospel, and the mercy of God will finally bring you to the heavenly Jerusalem, the kingdom of God, no matter how many turns you make along the way or how many times your goal may seem to recede. Along the way you will discover, and even carry, the cross, but the cross contains the resurrection- life with Christ and all the saints in the new Jerusalem" (45). "A thin place is one where ordinary matter seems charged with God's presence" (70). “Making the Most of Ministry Trips.” Youth Worker Journal. Sept./Oct. 2009. pp. 22-25. See a previous post: "Our Pilgrimage to Philadelphia" Recently our youth ministry begun a pahe invitation ocal pilgrims in Tegucigalpa to spend a week in community, conversation, worship, and service with their churches and youth. What is interesting is that when one travels as pilgrims versus as altruistic blitzers, relationships begin to form that would be otherwise missed. Every year thousands of "pilgrims" walk to El Santuario de Chimayo in order to pay homage to the tiny shrine believed to be built on sacred earth and containing miraculous healing powers. I drove there one year filled a tiny vial with a bit of the dirt (we are encouraged to do so) and took it back to our condo. However, I didn't "feel" the specialness of the experience and wondered what my problem was. And then one year I walked miles from Santa Fe to Chimayo with other pilgrims. And there it was...the curative powers of the healing Spirit. It was in the journey, not the vial of dirt.